Is your Cat showing signs of being stressed out? Do you want to calm your Cat down or learn how to destress your Cat? Because in this article I’m going to show you the different ways that you can use to calm your Stressed out Cat down. Then I’ll show you ways of helping your Cat feel relaxed and calm. Just as humans get stressed out, our little feline friend can get stressed out too. Truth is, Cats can easily get stressed out and this can cause your Cat to urinate inappropriately. And we Cat parents can agree this can be the most frustrating problem we can ever face! So now if you find puddles on rugs or on furniture then that could be a result of a stressed out Cat. Did you also know that stress can cause a physical condition too? It’s called interstitial cystitis which can occur in your Cat. So what is interstitial cystitis? 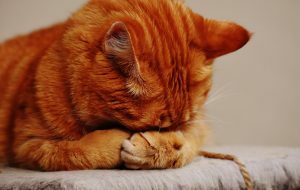 Although it may not be completely understood, it appears to affect the nerves that is connected to the bladder which can make your Cat lose control hence the reason they may urinate other than the litter box. First and foremost it is important to rule out any medical Conditions by visiting the Vets. Spraying can be the most common sign of stress in your Cat. Spraying is normal for Cats. They spray to mark their territory or to make a sexual announcement. if this is done in the house then it is usually stress related. Spayed Female and Male Cats will spray. It can be very frustrating when your Cat decides they don’t want to use the litter box and instead urinate on your brand new Carpet, or leave a little surprise for you in your cupboard. Well, this my fellow Cat parent is a sign of Stress. Just a small advice, don’t punish your Cat if this does occurs. 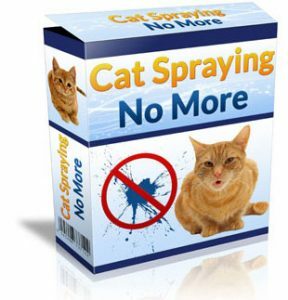 If your Cat is avoiding the litter box which is a common problem then you should definitely check out Cat Spraying No More. It’s a awesome guide on helping your Cat use the litter box permanently and all the other reasons why your Cat may be avoiding it. I personally bought Cat Spraying No More and boy it’s the best decision I have ever made. It really is a big help for us Cat Parents. If you notice your Cat starting to over-groom then this is another sign of stress in your Cat. This is a hard one to recognize because a Cat would spend around 30% of their life grooming themselves. They are very clean animals so you just have to keep an eye out on this one. 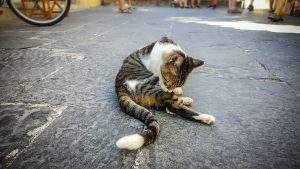 One way to find out if your Cat is grooming themselves more than they need to is if their fur starts to fall out and their are patches in the skin. If your Cat has started to behave in a aggressive way all of a sudden then this can be a sign of stress. Your Cat will make it’s body as huge as possible to scare people off. Cats are not just only intelligent but they are sensitive too. This is why they could get stressed very easily. 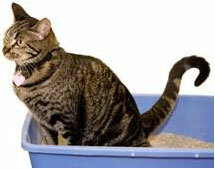 If you need to make changes to the house then do so but gradually as this will help reduce the stress in your Cat. If a new baby is expected (Congratulations if this is the case!) then set up your baby’s room in advance by adding new furniture again gradually. If you are moving homes then don’t let your Cat be involved in the packing and unpacking or repairing. Let your Cat explore this new home on his own terms and get used to it. 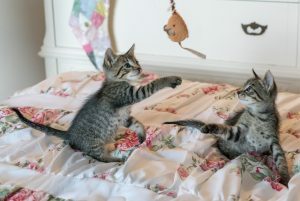 When a new pet is introduced to the family whether it’s a dog or Cat, this can be a very challenging time for your Cat because remember Cats are very territorial. This can lead to stress and spraying in the house marking his territory. The same can be applied with an introduction of a new baby or mother in law. When introducing a new Cat or dog then the best way you can do this is by introducing them gradually. Create a separate room for the new Cat. Let your Cat get used to the new smell and noise and introduce them later. Do remember that Cats coming from the neighborhood can be a reason for your Cats stress too. Cat loves routine. That’s a fact. If your Cat loves waking up, stretching, grooming himself and then goes straight to the food bowl and he finds it empty then this can cause stress for your Cat. Cats love having a daily routine to rely on. Nap times, meal times, play time, they all love this to be approximately the same time. You should try and schedule your time with your Cats time which means you need to stay disciplined with your schedule. Try play with him at a certain time which is convenient to you and stick at it. Same with feeding him. If you can’t stick to this plan then gradually change this with a schedule that suits you. Well, try staying at home more with your Cat! I wish we could all do that and spend more time with our little feline friend but this is not possible so what you can do is, get someone who your Cat is familiar with and get them to spend time with your Cat whilst you are away. In the current condition we live in this world we can all agree that life can be very stressful! Everyone gets stressed due to work, family responsibilities and all this stress we have can have a negative effect on our Cat which makes them stressed too! You see Cats are amazing and they have these sense of feelings to your actions and this can change the mood of your Cat accordingly. Cats can get stressed and we as Cat parents should take extra notice to see any sudden changes to our Cats behavior. Especially if they are starting to avoid using the litter box and urinating inappropriately. Play with him – Make sure you spend at least 15 – 20 mins a day spending time with your little kitty and give him that affection that he deserves. This will also reassure your Cat that everything will be okay. Playing with your Cat will definitely help reduce any tension and ensure your Cat is always happy. Spend quality time together – You should be already spending time with your little kitty but if you see your Cat being stressed then give them that extra affection and love. Whether it’s just sitting with them quietly or just stroking them and petting them. Let him sleep on your Lap (My Cat loves doing that!). These action of yours will give your cat that reassurance and ease that stress and ultimately make him a happy Cat! You should remember that each Cat is different and some may get stressed over different things so keep calm, and help your Cat accordingly. It’s impossible for your Cat to have a stress free life but what we Cat parents can do is not get stressed out ourselves. Well, even that is impossible being stress free so yeah, it’s okay to be stressed out here and there. 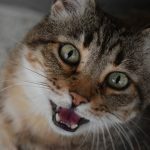 What you can do is control your Cats stress level and ensure it doesn’t get to something severe where it could have a negative impact on your Cat’s health and behavior. How To Stop Your Cat From Spraying In The House – Fast & Easy Way!